First Nations children’s art, created at residential and day schools, opens pathways for healing and reconciliation. MARK ATLEO (Kiikitakashuaa) of the Ahousaht First Nation is a survivor of the Alberni Indian Residential School. He was there for nine years, beginning when he was seven years old. Away from his family, he had to be brave not just for himself: “I had a younger brother who I had to watch over when I was there,” recounts Atleo. “He was crying every day that he wanted to go home, wondering why we were there. So I had to console him in the classroom, just being a big brother.” Atleo recalls running away, only to be brought back, during his last year there. He ran away because he was not allowed to attend his grandmother’s funeral. I had the honour of hearing Atleo’s words in the upstairs curatorial spaces of the University of Victoria’s Legacy Downtown art gallery. He was there with Andrea Walsh, PhD, the curator of There is Truth Here: Creativity and Resilience in Children’s Art from Indian Residential and Indian Day Schools. It was an emotional conversation; the three of us were each weeping at some time during our hour together. Andrea Walsh and Mark Atleo with a painting Atleo created while attending Alberni Indian Residential School. Photo by Tony Bounsall. 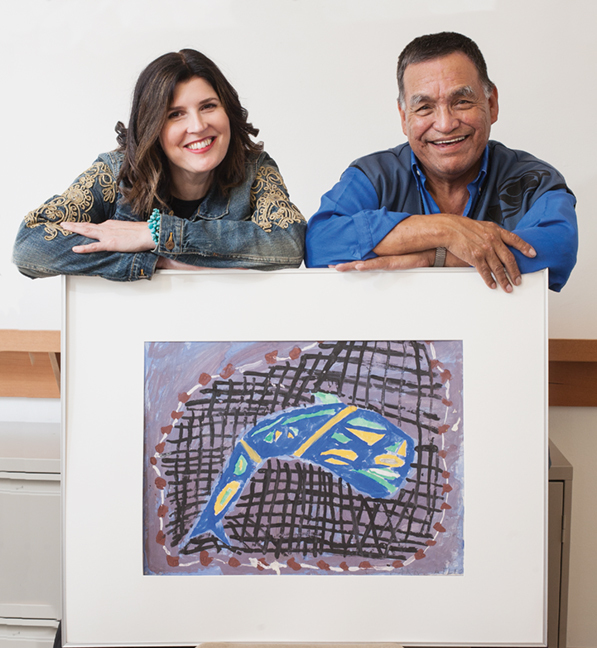 A visual anthropologist at the University of Victoria, Walsh collaborates with First Nations groups across Canada to research and repatriate artwork that was created by residential and day school students. 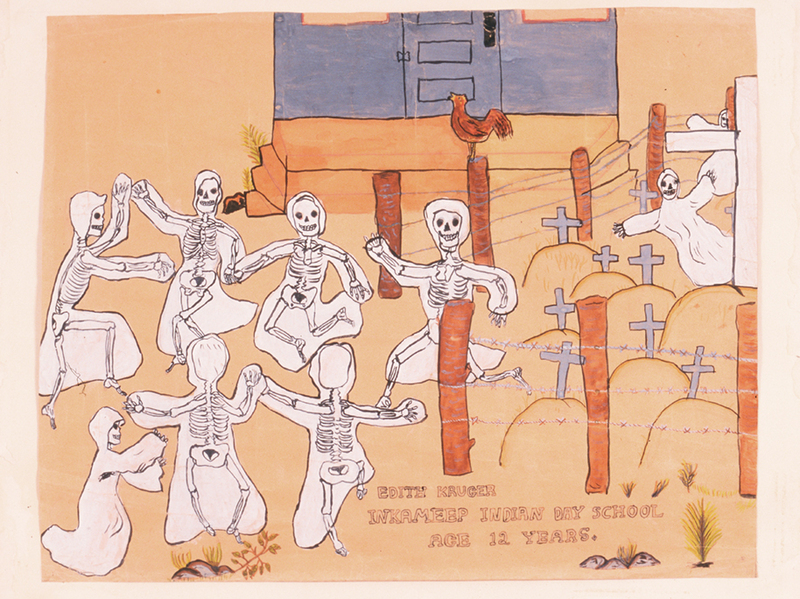 In 2008, a collection of paintings was bequeathed to UVic from the family of Port Alberni artist Robert Aller, who volunteered at the Alberni Indian Residential School (IRS) teaching extracurricular art classes. Shortly afterward, Walsh got involved in the process of repatriating these artworks to the survivors who had created them as children between the late 1950s and early 1970s. Following cultural protocols and collaborating with survivors, these paintings formed an exhibition at Legacy Downtown in 2013 and the Alberni Valley Museum in 2015. In September 2013, the Commissioners for the Truth and Reconciliation Commission invited the Alberni survivors to share their stories and paintings at the closing ceremonies in Vancouver. Again following cultural protocols, Walsh and her group used the opportunity to reunite Mark Atleo with a painting he had done as a child. In front of 1000 witnesses, “I cried,” Atleo says in his quiet voice. 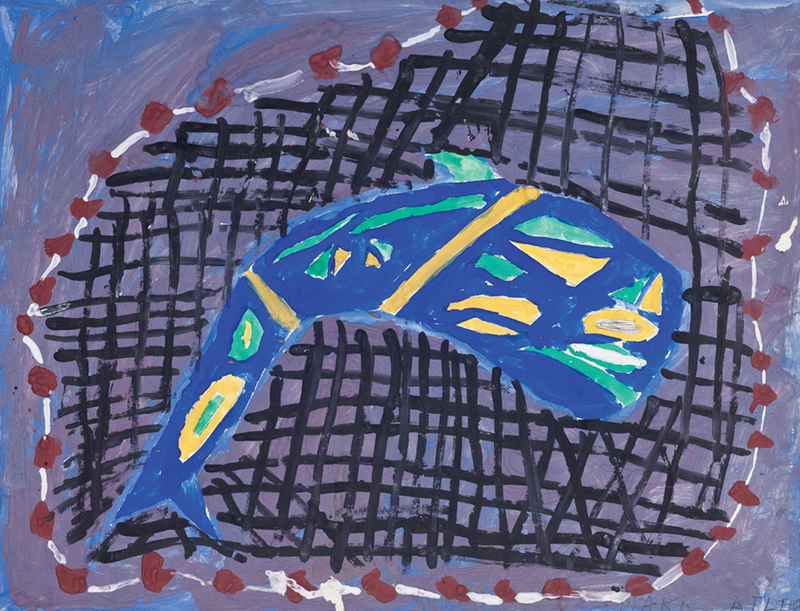 That child painted a vibrant blue fish—“a sockeye; that’s our favourite fish”—adorned with yellow and green, in a style mimicking what he would have seen at home. It rests in a net above a swirling blue and purple poster-paint sea. Recalling the painting of it, Atleo says, “All it was is that dark, shady background. Mr Aller said, ‘paint what you really like; what’s in your life.’ I just thought about fishing. [What] I wanted when I grew up was to be a fisherman. We were taken away when I was just starting.” His grandfather had taught him all about fishing. “To get this [painting] back was something else,” he shares. The painting “opened me up towards my other classmates, our group. We had been apart for so long; now we see more of each other. It’s great.” Atleo has since shared his story on panel discussions and with university students. Fifty paintings from Alberni Indian Residential School survivors, including Atleo’s, will be displayed as part of There is Truth Here, along with collections from students who attended the McKay Indian Residential School in Manitoba, the Alert Bay Indian Day School, and the Inkameep Indian Day School in the Okanagan, between the early 1950s and early 1970s. Works will include drawings, paintings, exquisite handmade buckskin costumes, and many photographs depicting dramatic children’s performances of Okanagan stories. All the works on display will be put into context. For instance, the Alberni and Inkameep collections exist due to teachers who would be considered renegades for encouraging the children to express themselves and their culture authentically, without censorship. Other collections show a more practical intention, but still contain marks that connect to and evidence an individual, a unique person, a person of value in an impossible place—one that had been wiped from collective memory. Displaying these works is a step toward correcting that erasure. There is Truth Here: Creativity and Resilience in Children’s Art from Indian Residential and Indian Day Schools is at the Legacy Downtown Art Gallery from September 23, 2017 to January 6, 2018. Panel discussion with survivors September 30. Contact Legacy Downtown for more information. 630 Yates Street, 250-721-6562, www. uvac.uvic.ca/Locations/legacy. When Aaren Madden discussed the subject of this article with her family, she listened as her son jumped in to explain to his younger sister what residential schools were. Rightly, finally, he had learned about them in school.